It’s one of my theories that when people give you advice, they’re really just talking to themselves in the past. This list is me talking to a previous version of myself. I drew this cartoon a few years ago. There are two panels. 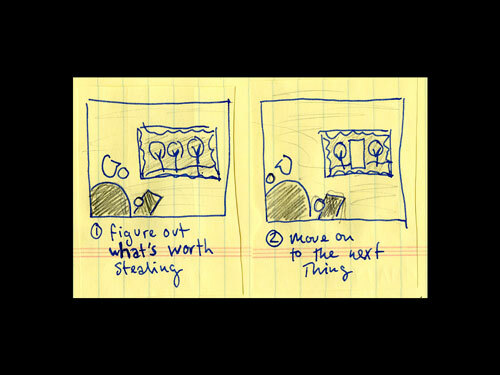 Figure out what’s worth stealing. Move on to the next thing. This entry was originally posted at http://pj.dreamwidth.org/288746.html. Please comment here or there there using your LJ ID or OpenID.